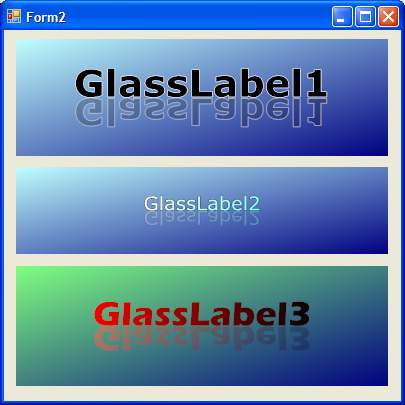 A while ago, I was working on a Windows Forms application and I needed a special label control with reflection (glass) effect to show some titles in a stylish way. I've always enjoyed working with graphics, but it's never too clever to re-invent the wheel, so the first thing I did was google for a control that satisfied all my needs. Unfortunately (or not?) I didn't find anything. I was looking for a label-like control that automatically reflects it's text contents like in a glass. Of course, reflected text must appear semi-transparent. All other control capabilities were welcome too. As I said, didn't find anything event remotely similar. It must be a true label control. It will show a reflection or glass effect of the text drawn. The control's background can be filled with solid or gradient colors. The control's text can be filled with solid or gradient colors, too. The text can draw (or not) a solid-color outline with configurable width. The level of transparency must be configurable, too. I ended up with what you see above. Not bad, uh? Fortunately I can say that all goals were reached. Once done, I thought that writing an article focusing on the graphics work for this control would be a good idea. So I will comment on what I've done and why I did it and will finish my article with the complete code listing of the control. As said in my requirements list, the control must be a true label control. So I started creating a new class and inheriting it from the standard WinForms Label control. The second change that I made was remove the possibility to place the text anywhere on the control (TextAlign), so in my control the text will be always horizontally and vertically centered. 'be aligned always at Middle-Center. This last is not really necessary, because I do all the painting over the control and so I decide exactly where the text appears. In fact, this change is useful only in the Properties Window, where you'll see always TopCenter in the TextAlign property and you will not be able to change it. But even without this piece of code the control will look exactly the same. 'All the painting work is done here. Of course, you can use your gradient brush with rectangles, ellipses, polygons, regions, paths, etc. In the complete listing of GlassLabel control you'll find some code in which I use gradients, and you'll see how easy is to use them. There are some methods to draw text into a Graphics object. The most basic of all is using the DrawString method, which takes some parameters (text, font, size, location...) and draws the text using the brush that you want. But for the outline requirement I needed more functionality than DrawString offers. So I used GraphicsPath object. As MSDN says, GraphicsPath represents a series of connected lines and curves. Applications use paths to draw outlines of shapes, fill the interiors of shapes, and create clipping regions. Best of all, the GraphicsPath object provides with it's own AddString method, so we just need to call AddString on the GraphicsPath and it creates a path that outlines the string passed. After that, you can both draw the string outline or fill its contents. In the complete listing of GlassLabel control you'll find some code in which I use GraphicsPath, and you'll see how to use them. As may be obvious, the more difficult of the requirements was the glass or reflection effect. As with almost all in GDI+, there are many ways to do this. But I think that I've used maybe the simplest of all. A graphics object supports a series of transformations that can affect to his size, rotation angle, etc. Once one of this transformation is applied to a graphics object, all the painting work done over the object is affected by the transformations done. This transformations can be cumulative and that gives us an extremely powerful mechanism to work with graphics. In this case I did a really simple transformation: I "said" to my graphics object that all the painting must be affected by a scale transformation. The scale applied is 1 for the horizontal axis (so no transformation) and -1 for the vertical axis (so no transformation in size but vertically reflected). It's as simple as that. You'll find the complete sample in the code listing at the end of the article. After this point, all that I paint over this graphics objects (text, shapes, etc) will appear vertically reflected. Well, believe it or not, with the use of these few GDI+ objects, all can be done. Here is my complete listing code for the GlassLabel control. The code is well commented and I think that you can follow it easily. As a suggestion for further work, maybe it would be a good idea to not override the TextAlign property and make it work in the control as expected, re-calculating the position for each one of the possible values. Another interesting challenge would be to find a way to show the reflection effect in perspective. 'transparency in the reflected text. Values must be between 0 and 255. 'The lower value, reflected text is more transparent. 'The higher value, more opaque. 'All the paintint work is done here. 'let us to choose a color to clear the background. 'Reset the transformations done until here so we start from a "fresh clean"
'drawings done after the instruction will be affected by the scaling done. 'will be vertically inverted (the reflection effect that we want). 'text's outline will appear too much "solid"
I hope that you find this control to be useful. Feel free to use it in your applications and modify to your convenience.